HACKSTRONAUT.com: Home of The Hackstronauts. Our recommended list of educational vacation spots, publicly open research facilities and scientifically significant world destinations. What could a Hackstronaut be up to on any given Friday? A beer with buddies? Where’s the hack in that? How about a new and novel way to cut loose, tune in and chill out? Well then, Kavasutra must be our destination. If it’s your first experience with Kava (Wikipedia: Kava) or Kratom (Wikipedia: Mitragyna speciosa) some of us are well experienced with the stuff so feel free to ask us what to expect. Now some grown-up stuff… Be assured we will have your back so that this will be as astounding an experience as possible while being safe and educational. That being said we still insist that you take ultimate responsibility for your own wellbeing and conduct. Okay, lets have some fun with this! Play is what evolved beings do to learn. Note: Kratom has been said to have a nootropic effect along with its more recreational aspects. Guess I’m giving away what I’ll be drinking. Prost! KavaSutra is America’s finest Kava Bar serving premium kava and other herbals. We now have locations in West Palm Beach, Lake Worth, Delray Beach, Fort Lauderdale, Denver, and New York. Our Kava and Herbals are the best of the best and we import all Kava directly from Vanuatu where Kava ceremonies date back thousands of years. This kava is known to be the highest quality kava root available in the world. 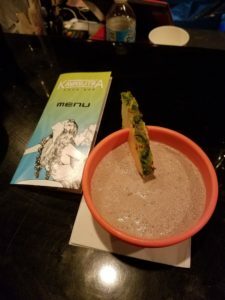 KavaSutra Kava Bars have a relaxing, tranquil environment where you can come in, kick back, drink a kava shell and relax within a non-judgmental and welcoming gathering place. Come join our MeetUp Group NYC Biohacking, Nootropics, Limitless to see where this all began. This post was the invitation to our MeetUp Group on 10/21/16.